Minnesota’s race for governor made the New York Times on Monday when columnist Peter Applebome cited Republican candidate Tom Emmer in a piece about candidates with what Applebome considers extreme views. The column focused on the case of a Republican candidate for Congress in New York State whose right-wing writings and associations are so controversial that his own Republican Party is going to court to have him removed from the ballot. Eugenics and Nazis were mentioned. Davis, for those who have forgotten their 7th grade history, was president of the Confederacy, which seceded from the Union, bringing about the Civil War. Minnesota fought for the North. Somebody should tell Emmer. Duluth – well, a long-standing Duluth company – got some favorable mention in the New York Times on Monday. Each Monday, the Times publishes a feature called “Metropolitan Diary” in which New Yorkers describe personal experiences reflecting city life. The item relating to Duluth doesn’t mention Duluth but cites the W.P. & R.S. Mars Co. (link HERE), the venerable industrial supply firm with headquarters here. It’s a real “Yes, Virginia, there is a Santa Claus” type of story involving Twix bars, a little boy in NY City and a hand-written letter from a warm-hearted W. P. & R. S. Mars employee. But let’s allow the NY Times Metropolitan Diary tell the tale. Click HERE to read the story. Great spotting by Paul Lundgren and Susie LeGarde Menz in Perfect Duluth Day Blog (link HERE) of a 1965 ad for the opera performance of (I think) La Traviata, held in the Duluth Denfeld Auditorium. 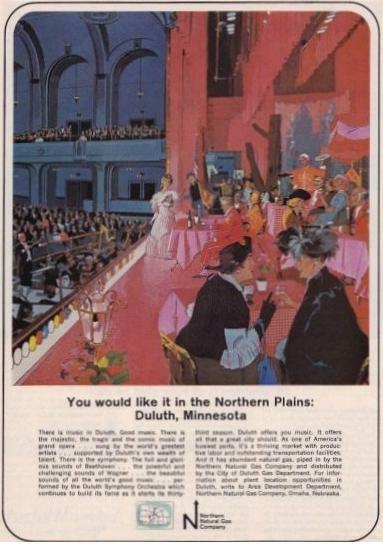 This artistic rendering (below)–including the architectural beauty of the Denfeld auditorium–was featured in a Time Magazine advertisement for Northern Natural Gas Co., now Enbridge. They featured the (then) Duluth Symphony Orchestra performances in their advertising campaign. This ad made quite a hit in Duluth when it came out, with national focus on our local community arts. I discovered that you can purchase this lovely art poster for $9.95 through E-Bay natural gas collectables (HERE). The text in small print in the ad reads as follows: "There is music in Duluth. Good music. There is the majestic, the tragic and the comic music of grand opera … sung by the world’s greatest artists … supported by Duluth’s own wealth of talent. There is the symphony. The full and glorious sounds of Beethoven … the powerful and challenging sounds of Wagner … the beautiful sounds of all the world’s good music … performed by the Duluth Symphony Orchestra which continues to build its fame as it starts its thirty-third season. Duluth offers you music. It offers all that a great city should. As one of America’s busiest ports, it’s a thriving market with productive labor and outstanding transportation facilities. And it has abundant natural gas, piped in by the Northern Natural Gas Company and distributed by the City of Duluth Gas Department. For information about plant location opportunities, write to Area Development Department, Northern Natural Gas Company, Omaha, Nebraska." This scene depicts one of many grand operas presented at Denfeld by the Duluth (before it became Duluth-Superior) Symphony association and before the DECC Auditorium opened in 1966, after which the operas were presented there until around the mid-70s, then discontinued. The operas featured the Duluth orchestra, local soloists in minor roles, and leads sung by prominent opera singers of the day, mostly from New York. in the back) and Paul Brissett to the right behind Sue. Sorry my eyes are too old to identify the others. 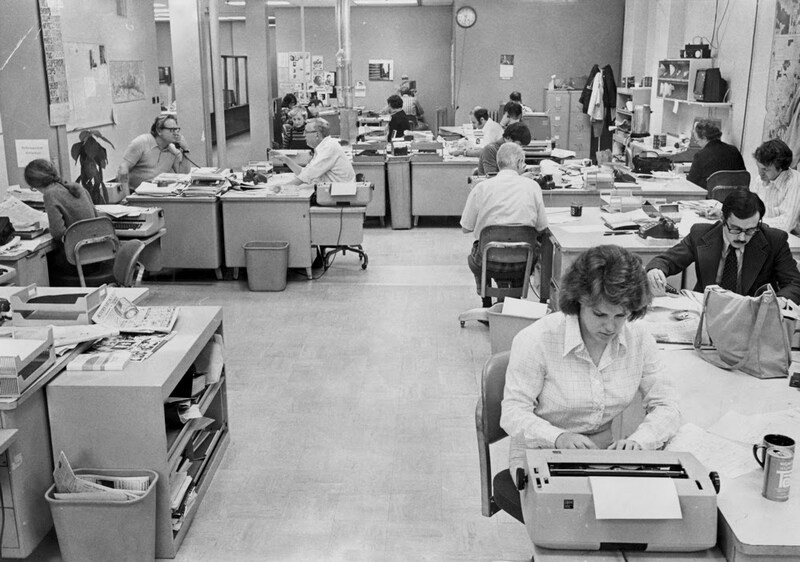 I’ve enjoyed reading excerpts from Laurie Hertzel’s book recounting her early experiences as a reporter and editor at the Duluth News Tribune. The newspaper is doing her – and itself – a great favor by publishing the excerpts as Laurie’s book, “News to Me: Adventures of an Accidental Journalist,” is introduced this week. Her official book launch gathering is at 7 p.m. Thursday at Fitger’s Spirit of the North Theater. Now the books editor of the Star Tribune of Minneapolis, Laurie, who grew up in Duluth, spent nearly 20 years at the Duluth paper, starting with clerical work while still a teenager and evolving into one of the paper’s leading reporters (and editors, after a stint on the copy desk), by the time she left for the Twin Cities about 15 years ago. I’m pleased to report that I had a small hand in helping her put the book together. We sat for an afternoon in a Duluth restaurant about a year ago and talked about the “old” days at the newspaper, starting in the first half of the 1970s when she showed up there fresh out of high school. Reading the published excerpts (I haven’t read the entire book yet; I’ll buy one at the launch and have her sign it), I am reminded what an excellent writer Laurie is. Beyond that, she is an impressive memoirist, calling up events and people from more than 30 years ago with fidelity to the way I remember them as well. 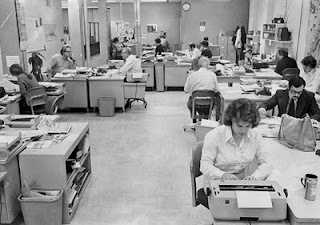 Working in journalism can be frustrating (newspaper owners are notorious skinflints) and at times a drudge (yes, there’s routine), but it also is interesting, even compelling, much of the time. Overall, I loved my newspaper career, and it’s clear now that so does Laurie. With this book, she’s on the record. Note: Connect HERE to access Laurie's book web site and HERE, HERE and HERE for the DNT coverage, including excerpts from her book. See you on Thursday night for the big Duluth launch!